Use this crafty art/drafting table to create your greatest inspirations and projects. DIVERSIFIED WOODCRAFTS Art/Drafting Table - 36x24x30 (Quick Ship): Every artist needs the right equipment for the perfect projects to be born. 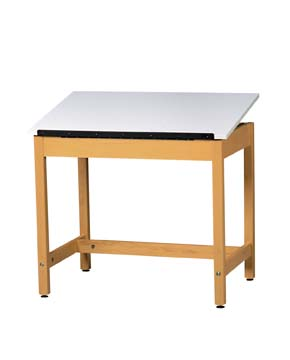 This beauty of an art/drafting table will help aid in your career and dreams. You do not have to worry about it breaking after a couple of uses. This product is strong enough for even the roughest uses in the classroom. The one piece top is adjustable to suit whatever project you are working on. The 3/4" fiberesin material will be easy to clean at the end of the day. The framing and legs are made of solid maple, proving that the table will not break so easily. This product is all held together with a mortise and tenon joint construction and a steel plate reinforcement. The 36x24x30, this table will be the perfect side to use in the classroom, dorm, or a small art studio. You can easily put away when not in use.